Special offer 80€/person instead of 105€/person (original price) if you book with us! Visit Poros, Hydra, Aegina, the three most beautiful islands close to Athens and enjoy a great variety of delicious Greek food on board as well as live music program and entertainment! The price includes all taxes, full meal (fish, meat, chicken, salads, appetizers, dessert, wine, soft drink, mineral water, coffee) and live music. Departure from Piraeus port at 08:00 and return to the port at 19:30. Itinerary: Piraeus, Poros, Hydra, Aegina, Piraeus. Book with us to get the special offer! Every year AthenStyle takes part in Earth Hour as part of our green initiatives aimed at conserving energy and protecting the environment. This Saturday, the 29th of March, we will be once again taking part in Earth Hour. Earth Hour is a worldwide movement for the planet organized by the World Wide Fund for Nature (WWF). Earth Hour engages a massive mainstream community on a broad range of environmental issues. It was famously started as a lights-off event in Sydney, Australia in 2007. Since then it has grown to engage more than 7000 cities and towns worldwide, and the one-hour event continues to remain the key driver of the now larger movement. The event is held worldwide, encouraging individuals, communities, households and businesses to turn off their non-essential lights for one hour as a symbol for their commitment to the planet. Earth Hour 2014 is scheduled for Saturday, March 29, from 8:30 p.m. to 9:30 p.m. during participants’ local time. Earth Hour was first held Greece in 2009 with more than 500 municipalities and towns switching off! The Greek capital of Athens, and the cities of Thessaloniki, Patras, Volos, Herakleion, Ioannina and Alexandroupoli took part. Even more landmarks and iconic buildings than ever showed their support in 2011, from the Parthenon at the Acropolis, The Greek Parliament Building, the White Tower, the bridge of Rio-Atnirio. WWF Greece is responsible for coordinating Earth Hour in Greece. With each passing year, Earth Hour is becoming more than just an hour, more than just an action: it is becoming a movement. This year, for Earth Hour, we ask you to amplify the hour and think about how you can make your life more sustainable after Earth Hour. One of the easiest and most impactful ways to start is to make the switch to energy efficient lighting, and taking charge of your own environmental imprint on our planet. For just one hour at 8.30pm – turn it all off and have a warm feeling that the simple act of flicking a switch will make an enormous difference to our Earth. No phone, no lights or no internet for a whole hour? Are you horrored thinking what you are going to do? 2. Sit outside and do some star gazing. When is the last time you looked at the stars? 3. Go for a night time walk. 4. Use torches to pull some really funny faces. For this Earth Hour, Come to our famous Rooftop Bar and let’s have fun all together under the candle lights! Earth Hour is not about one hour in the dark. It’s a symbolic act to get us thinking about our planet and our impact on it. Whatever you want to do, Do It In The Dark! The 25th March is a National Holiday in Greece. On that day, we celebrate the Greek War of Independence, also known as the Greek Revolution. It was a successful war of independence waged by the Greek revolutionaries between 1821 and 1832 against the Ottoman Empire. The slogan of the revolutionaries was “Freedom or death”. As a result, Greece was finally recognized as an independent nation in May 1832. It is celebrated each year with a big parade in the center of Athens, starting from Syntagma square and finishing on Panepistimiou Street. However, the 25th of March has a double meaning for Greeks. It also the day of the Annunciation, It is the Christian celebration of the announcement by the angel Gabriel to the Virgin Mary that she would conceive and become the mother of Jesus, the Son of God, marking his Incarnation. This year, on Tuesday 25th of March2014 there will be free admission to the Acropolis Museum from 9am to 5pm. From The April All Museum In Athens Will Accept People From 8am to 8pm!!!! The Athens International Tattoo Convention sets the pace of the tattoo community in Greece for the 8th consecutive year. Once more, it will attract thousands of visitors as well as some of the best Greek and foreign tattoo artists, with tattoo competitions, graffiti shows, live music, a shopping and trading area and much more!! Those who choose our hostel as their accommodation during the Convention, will get 10% discount off our normal prices!!! 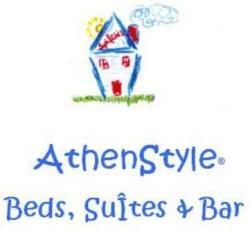 The only thing you have to do is book through our site http://www.AthenStyle.com, write as a comment that you are for the tattoo convention and leave the rest to us!! Come to live the real tattoo experience!! El pasado sábado organizamos en Athenstyle una fiesta brasileña, en la que servimos comida típica (Picanha con salsa de mostaza y miel, acompañada de patatas al horno y ensalada) y nuestra super bartender Anna, preparó unas Caipirinhas increibles. Durante todo el evento pudimos disfrutar de música brasileña, con la que algunos se animaron a bailar. La fiesta empezó sobre las 9 de la noche y terminó sobre las 5 de la mañana, aunque el bar del ático se encontraba abierto desde las 5 de la tarde. No podemos menospreciar el hecho de que el evento se realizó en un lugar privilegiado por sus vistas al Partenón, el cual de noche se ilumina y dota al lugar de un color especial. El evento fue todo un éxito y el bar estaba lleno de gente disfrutando del ambiente que ahí se concentraba. La gente interactuaba unos con otros creando el famoso ambiente de los hostales, en los que conocer gente de todas las partes del mundo, es posible. El próximo evento que se celebrará allí arriba será una fiesta en honor a San Patricio, el 17 de Marzo, esta vez no os lo podéis perder. Tendremos muchas más ofertas que ofreceros en un ambiente cercano, cálido e irlandés.